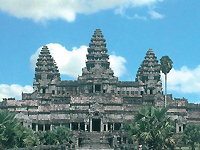 The treasures of Cambodia, Indonesia, Laos, Myanmar, Thailand and Vietnam, the treasures of Indochina are revealed to you. 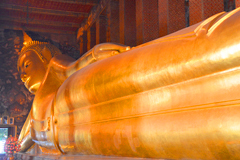 Explore Bangkok, including the Grand Palace and the Emerald Buddha. In Siem Reap, watch the sun set over Angkor Wat. Visit Vietnam, where you enjoy the colonial architecture in Hanoi and the pristine waters off China Beach. In Siem Reap explore the treasures of the Angkor complex with Angkor Thom, Bayon Temple, Elephant and Leper King Terraces and Ta Prohm. 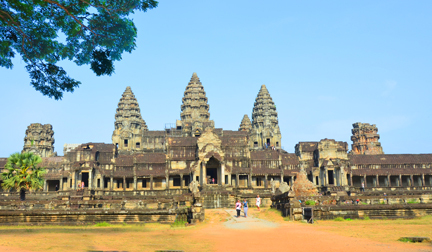 Explore two less-visited areas: Banteay Srei and Banteay Samre. Sunset is spectacular at Angkor Wat. With many islands making up the country it is a melting pot of people, cultures, customs, food and landscapes. From Java to Bali and over 18,000 islands; this is a water paradise with exceptional sightseeing and diving. 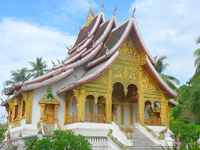 In charming Luang Prabang visit Phoussy Temple. Take part in a food offering to the local Buddhist monks. Sightseeing includes stops at the Pak Ou caves Thamting and Thamphoum, as well as Wat Longkhoun and the village of Ban Xanghai. 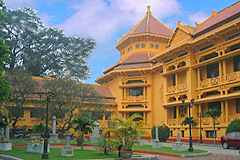 Explore the Royal Palace Museum, local market and Kuang Si Waterfall. Myanmar is a golden land of gentle people and gracious hospitality. Time has stood still here for centuries, revealing traditions continuously followed and lifestyles at one with places of astonishing natural beauty. 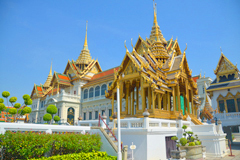 Discover the Grand Palace of Bangkok, temples of Chiang Mai and the beaches of Phuket. The gentle Thai people invite you into their ancient culture. 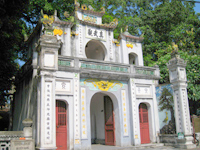 In Ho Chi Minh City visit the Thien Hau Pagoda in the colorful Chinatown of Cholon. Explore the Cu Chi tunnel network, a battlefield of the Vietnam War. 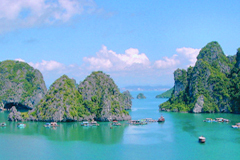 Journey overland to Ha Long Bay for a cruise among its scenic grottoes and islands. This tour of Thailand, Cambodia and Vietnam encompasses the best of Southeast Asia as you explore the legendary cities of Hanoi, Hué, Ho Chi Minh City and Bangkok. Studded with mountains, forests and sun-kissed shores, Vietnam is experiencing a rebirth as one of today’s hottest ravel destinations, with a legacy of history that is chronicled in elaborate carved tombs, walled cities, ancient artifacts and sandstone monuments; Cambodia astounds with scenic beauty, a tradition of Indochina culture and ancient sites; and Thailand, abundant in golden temples, jeweled sculptures and heaven-bound spires, boasts an innate elegance that shines in people themselves. There has never been a better time to visit. This 16-day Thailand, Cambodia and Vietnam tour encompasses the best of Southeast Asia as you explore the legendary cities of Hanoi, Hué, Ho Chi Minh City and Bangkok. 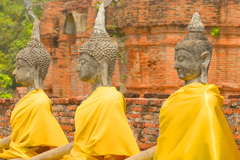 Discover golden Buddhas, ancient kingdoms, inspiring temples and lush landscapes, and experience the cultures and traditions of this fascinating area of the world for yourself. From a water puppet performance to ornate pagodas and soaring temple spires, gilded palaces to bamboo stilt houses, everything about this journey is special. Ride an elephant into the jungle near Chiang Mai and cruise on the klongs of Bangkok. In Vietnam tour poignant reminders of war like the Cu Chi Tunnels and notorious Hoa Lo Prison, and see the legacy of peace as you visit a kindergarten in Da Nang. Experience the grandeur and archaeological significance of UNESCO World Heritage Sites such as Angkor, Hoi An and Hué, and stay at the finest city hotels and word-class resorts. Day 1 – Welcome to Hanoi! A transfer is included from Noi Bai International Airport to the landmark Sofitel Metropole Hanoi, your home for the next two nights, close to the historic Old Quarter and other notable attractions in Vietnam’s capital city. Meet your fellow adventurers at the welcome cocktail reception and dinner at Le Beaulieu in the evening. Begin your Vietnam tour with a memorable ride by cyclo (pedicab) through the back streets of Old Hanoi; stop at the infamous Hoa Lo Prison, known as the “Hanoi Hilton” during the Vietnam War. See the colonial Presidential Palace that Ho Chi Minh refused to live in, along with his “house on stilts” and his final resting place; and take in Hanoi’s famous One-Pillar Pagoda, constructed in 1049 to resemble a lotus blossom. Sample Vietnamese specialties for lunch, then spend the afternoon as you wish. A 1,000-year-old art form entertains you this evening during an enchanting water puppet performance, followed by an à la carte dinner in a restored French colonial landmark. No Vietnam tour would be complete without a visit to Hué, Vietnam’s most beautiful city, and now a UNESCO World Heritage Site, which you’ll fly to this morning. As you sightsee by cyclo, relive the imperial grandeur of the Citadel, which housed the Imperial City for the emperor’s official functions and the Forbidden Purple City for his personal time. 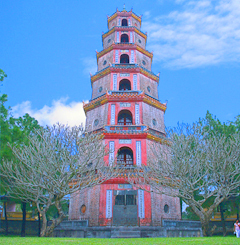 Admire Thien Mu Pagoda, a seven-story octagonal tower built in 1844, and cruise along the Perfume River, also the setting for your riverfront accommodations. After a visit to the tomb of 19th-century emperor Tu Duc in Hué, take in the scenery along the Vietnamese coast and Hai Van Mountain during a drive to Da Nang and the 18-mile-long “China Beach” – made famous by the 1980s TV show of the same name and now a popular Vietnam tour destination. You’ll spend the next two nights at the one of the most prestigious beachfront resorts in Vietnam, the Furama Resort Da Nang, set right on the shores of the South China Sea. 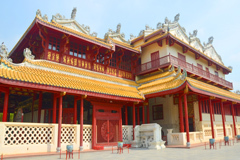 Pay a delightful visit to the students of a local kindergarten in Da Nang this morning, then continue your Vietnam tour by journeying to historic Hoi An, a key South China Sea trading port in the 15th through 19th centuries, and a UNESCO World Heritage Site. Explore its shop-lined streets via bicycle; view the red-painted Japanese Covered Bridge – the three Chinese characters over the door mean “bridge for passers-by from afar” – and tour the 200-year-old “Phung Hung” house, noted for its unique architecture. What you’ll see there will reveal much about the lives of Hoi An merchants long ago. Enjoy some time on your own in the afternoon, and have dinner at your leisure tonight. Take a morning flight to Ho Chi Minh City (formerly known as Saigon), Vietnam’s second-largest city; set off to the battlefield memorial site of Ben Duoc, northwest of the city, where you’ll explore an underground world of tunnels and chambers three stories deep at Cu Chi Tunnels with your local guides. Used during the Vietnam War, the 120-mile tunnel network housed kitchens, dormitories, munitions factories, hospitals, and schoolrooms. Following a picnic lunch, see more of Ho Chi Minh City as you wish for the remainder of the day, and have dinner on your own tonight. Explore Ho Chi Minh City with your local expert today, visiting the former Presidential Palace, now called Reunification Hall; see the former U.S. Embassy, the Saigon River,19th-century Saigon Notre Dame Cathedral and the stately Post Office. Later, Enjoy a taste of Vietnam’s diverse culinary heritage tonight with an elegant à la carte dinner at La Camargue, offering French, Vietnamese, and international specialties within a sumptuously restored villa setting. This morning, your Vietnam tour continues on to Cambodia as you fly to Siem Reap for a two-night stay at the Raffles Grand Hotel d’Angkor, the closest hotel to the treasures of the fabled archaeological site at Angkor, covering an area twice the size of Manhattan. You’ll be dazzled by what you see this afternoon at the vast, 12th-century Angkor Wat temple; the bas-reliefs and many devatas (guardian spirits) that cover its walls inspire awe and admiration. This example of classical Khmer architecture has been a significant religious center for Hindus and then Buddhists through the ages. Tonight’s dinner is à la carte at your choice of your hotel’s fine restaurants. Enveloped by jungle roots, fascinating Ta Prohm Temple almost seems to be a part of the dense rainforest that surrounds it. A legacy of Cambodia’s Khmer civilization dating from 1186, it was originally built as a Buddhist university and monastery and continues to captivate today, as you’ll see on your visit. The last capital of the Khmer empire, the walled city of Angkor Thom is home to the richly decorated Bayon Temple, known for its carved faces. When you see the Elephant Terrace in Angkor Thom, which was the foundation of the pavilion in which the king held audiences, you’ll understand how it got its name – and you can get some great pictures, because your day includes tips from a professional photographer! Later, you may wish to join us for a cruise on Tonle Sap Lake, revealing fascinating floating villages. Fly via Bangkok to charming Chiang Mai, Thailand, the “Rose of the North,” established in the 13th century, and known for its artistic and cultural heritage. Enter another world when you arrive at the luxurious Four Seasons Chiang Mai, where your richly appointed accommodations feature a Lanna-style sala (pavilion) looking out over gardens, terraced rice paddies, and mountains. Take some time to relax in this idyllic setting this afternoon before enjoying dinner at your choice of restaurants at the resort. Elephants – Thailand’s national animal – are an integral part of Chiang Mai’s economy and culture. Visit the Chiang Dao Elephant Training Center today to see how these marvelous animals are trained to work in a teak forest; you’ll have a chance to feed them bananas and sugar cane, and see them demonstrate various skills… including painting a picture! Then climb high onto one of these gentle giants for an ambling trek through the jungle followed by a picnic lunch. Enjoy the many amenities of your Mae Rim Valley resort at leisure this afternoon. A morning flight takes you to bustling Bangkok in time for lunch at the city’s Seafood Market and some time spent exploring on your own – kicking off a three-night stay at the Shangri-La Hotel, Bangkok, with accommodations in the deluxe Krungthep Wing. Thailand’s capital welcomes you warmly this evening with a dinner cruise on the Chao Phraya River. An express boat whisks you from the hotel for a morning of sightseeing in Bangkok, an intriguing mix of ancient and modern. Walk to the 18th-century Grand Palace for an “audience” with the Emerald Buddha, while the giant Reclining Buddha awaits your admiration at Wat Pho, the oldest and largest temple in the city. Following a traditional Thai lunch, a motorboat ride returns you to the Hotel for an evening at leisure and dinner on your own in Bangkok. Cruise up the Chao Phraya River and through a network of canals, called klongs, which lace the city. These often bustling “city streets,” lined with homes and small businesses, are where much of “real life” in Bangkok is found, as you’ll witness firsthand; stop at Wat Arun (the Temple of Dawn) along the way. Then, a tuk-tuk (auto rickshaw) transports you from the riverside to the Jim Thompson House, where you’ll join a local guide to tour a museum within the art- and artifact-filled Bangkok home of the expatriate American architect, OSS officer and postwar Thai silk entrepreneur who mysteriously disappeared in the 1960s. 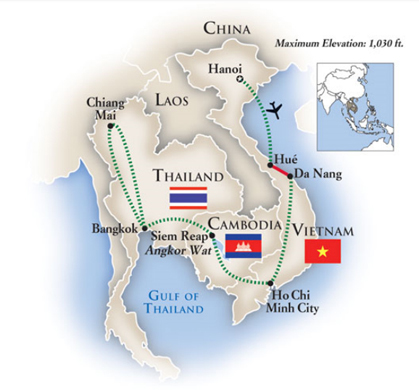 Cap an extraordinary Thailand, Cambodia and Vietnam tour with a farewell reception and dinner this evening. Your remarkable Thailand, Cambodia and Vietnam tour ends in Bangkok. Be among the first travelers to experience Myanmar, A Road Less Traveled on a 13-day journey from Bankgok to Yangon, Mandalay, Bagan and Inle Lake that includes 3 nights aboard a river cruiser and guided Myanmar travel days to temples, stupas, monasteries and more! Myanmar (ex Burma) is a golden land of gentle people and gracious hospitality. Time has stood still here for centuries, revealing traditions continuously followed and lifestyles at one with places of astonishing natural beauty. Let your imagination soar as you fly to Yangon for a Myanmar travel experience that resounds with what Marco Polo called “a golden land” of spired pagodas. Your Myanmar travel experience aptly begins in the land of smiles for the people you meet and the places you’ll see radiate warmth and welcome hospitality. Settle in to your Thai hotel nestled on the banks of the Chao Phraya River. Step outside of your hotel into a long-tail boat for a morning cruise down the “river of kings” to the royal home of Thailand’s kings until the turn of the 20th century at the Grand Palace. 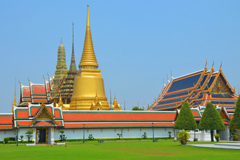 Your guided tour takes you inside the palatial complex to see one of the country’s most revered temples, the Wat Phra Kaew (the Emerald Buddha temple). The petite green Buddha, carved from a single piece of jade, is dressed in robes that change with the seasons to bring good fortune to the land. Ride through a flower market to Wat Po temple, where a huge gold leaf Buddha, more than 141 long and 49 feet high, reclines in unequalled splendor. 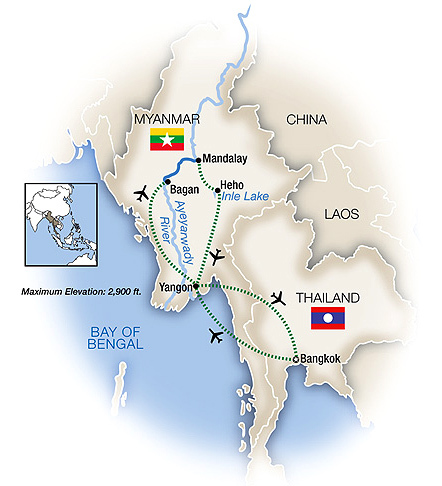 Fly to Yangon, the former capital city of Myanmar once known as Rangoon. This experience will open your eyes to sights isolated from the Western world for decades as you view golden pagodas, colonial-era buildings and traditional shop houses. In the words of Rudyard Kipling, “This is Burma and it is unlike any land you know about.” Upon arrival, drive to Chauk Htat Gyi Pagoda to see the giant reclining Buddha. Continue on to Sule Pagoda for a short walking tour past street vendors, old colonial buildings to Victoria Park. Sule Pagoda, a Burmese stupa thought to be more than 2,500 years old, became a focal point for contemporary Yangon and Burmese politics in recent times. Check into your restored colonial-style mansion hotel, awash in British traditions, in time for afternoon tea. A special sunset experience casts a glow this evening at the sacred hilltop Shwedagon (Golden) Pagoda, dominating the city’s skyline for over two millennia. It’s the lifeblood of the Myanmar people and it courses through the city of Yangon carrying all manner of goods and livelihoods. Learn more about life along the Yangon River on this Myanmar travel experience, beginning with a guided walk around the Kalaywa Taya Monastery. Our local expert will give you an introduction to Buddhism as he shares insights about the typical day in the life of the 1,300 monks and novices who live here. From there, go down to Scott Market – perhaps the most famous market in all of Myanmar. Explore the cobblestone streets of this bazaar, where anything and everything is for sale, before enjoying a traditional Burmese lunch, served family style, at a local restaurant. Fly to Bagan, city of temples. Drive to Dhamma Yazaka Pagoda, an infamous massive walled 12th-century temple with mysterious inner passageways. Get closer during a guided walking tour around the last temples of Bagan. Sightseeing continues at the Gubyaukgyi Temple; built in 1113, the inner sanctum is decorated with frescoes. Continue to Myingaba Village, distinctive for the huge stacks of bamboo the villagers use as walls for their homes and for its traditional Mon-style lacquerware, manufactured here for more than 900 years. Today’s sightseeing also includes Amanda Temple and Pyat That Gyi Temple. Visit a local market to see the fresh produce grown or caught along the Ayeyarwady River, including sacks of pearly white rice, fresh butter fish and betel leaves, and notice the thanaka “powder pasted” faces of the women and girls trying to keep their skin supple and safe from the sun. 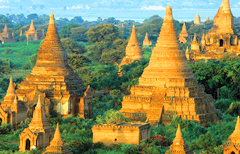 Visit Shwezigon Pagoda and Hti Min Lo Temple before a tour of the Archaeological Museum of Bagan and lunch. Few experiences can top this morning’s hot air balloon ride over the temples of Bagan. From the 9th to 13th centuries, Bagan was the capital of the first kingdom to unify the regions that would later constitute modern Myanmar. 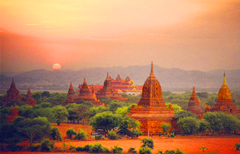 During its height between the 11th and 13th centuries, over 10,000 Buddhist temples, pagodas and monasteries were constructed in the Bagan plain; the remains of some 2,200 of them stand today. 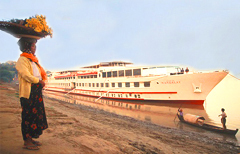 Touch down and board your luxury river cruiser this morning as she sets sail north towards Mandalay. Watch daily life unfold from the top deck of the ship as a local expert shares insights on the fascinating traditions and sites of villagers who make their homes near the river. Explore Mandalay, beginning with a visit to the “Big Book” at Kuthodaw Pagoda, where 729 marble stone slabs are inscribed with ancient Buddhist scriptures. Drive next to the wooden 19th-century Shwenandaw Monastery, made of teak and famous for its intricate woodcarvings. Watch artisans beat gold by hand with a large sledge hammer as it becomes the gold leaf that is used to decorate monasteries and temples in Myanmar at one of the area’s workshops. Marble carving is another craft that you will see as sculptors literally carve their livelihood in statues made from marble quarried from surrounding mountain range. See U Bein Bridge, believed to be the oldest and longest teakwood bridge in the world. Cruise to Mingun to see the pretty Hsinbyume Pagoda and the world’s largest uncracked bell. Visit Sagaing, considered by many to be the living center of Buddhist faith in Myanmar. Sagaing is also famous for its silversmiths; see artisans crafting silver in much the same way as their ancestors did. Disembark ship in Mandalay and head to Heho for a flight to Inle Lake. 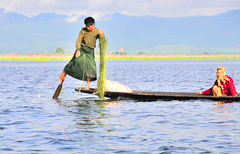 Life in Inle Lake revolves around the water so it is only fitting that we ride a boat to your lakeside villa. Enjoy fascinating views of floating gardens and stilt houses en route. Inle Lake is the only place in the world to see the famous leg rowers. Native Intha fishermen deftly grip a single long bamboo oar with one leg while paddling (and straddling) long flat-bottomed boats around the lake and its many canals—all while dressed in traditional Shan attire. Take an exciting ride to the Indein Pagoda Complex, home to some 1,000 stupas. Stroll around the pagodas and bamboo forests, and if it’s market day, mingle with the local Pa O people. Burmese Cats were once royal cats of the palaces, as well as guardians for the many temples and sacred sites and are protected here. 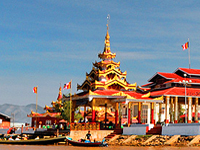 Boat to Phaung Daw Oo Pagoda, the best way to arrive at this 800 year-old, highly revered lakeside monastery. Inside it houses five ancient images of the Buddha that have been completely encased in gold leaf placed on them by worshipers through the centuries; their original shapes are virtually indistinguishable now and look more like solid masses of gold! The last day of your Myanmar travel takes you by boat to Nyaung Shwe Town where we will board a coach for today’s flights to Yangon and Bangkok. Arrive at the Shangri-La, Bangkok late this afternoon and have dinner on your own tonight. Your Myanmar travel experience ends in Bangkok. Fly home anytime. A transfer is included from the Shangri-La, Bangkok to Bangkok International Airport. Allow a minimum of three hours for flight check in.